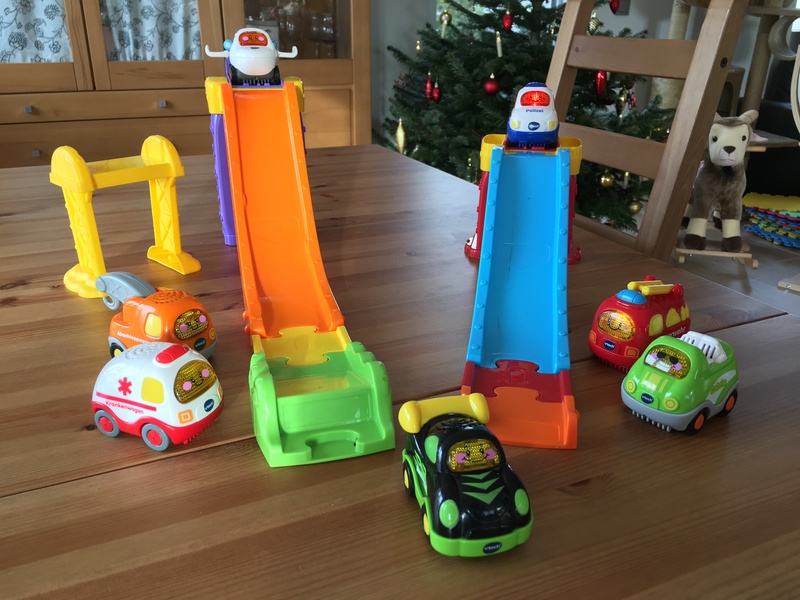 When my son Benjamin’s first birthday approached back in July 2016 I found myself looking for a great toy that I could give to him as a birthday present, and that Benni and I could enjoy together. You know, when having a one year old toddler at home, it can become quite difficult to find toys that your kid will love and that you as a mom or dad won’t find boring right? I was always into Lego, but let’s be honest: Even Lego Duplo is quite difficult to play with for a one year old. I tried it every now and then, but it always turned out to follow one simple rule: I build he, Benni destroys it 🙂 Don’t get me wrong, this can also be tons of fun, and I’ll probably describe my experience with that in another blog post soon, but it is not what I wanted to get as a first-birthday-present-experience! Somewhere in the back of the store I found what I was looking for. There was a whole area with VTech toys, and they caught my attention. What I saw there were tons of colorful, well designed boxes with playing and laughing kids on them. Well, obviously, you shouldn’t make your buying decision based on smiling kids printed on a box by some company you’ve probably never heard of before; but what I’m saying that it caught my attention. Another great thing I remember was that if you want to, you can basically try out every toy, as the VTech boxes have cutout on certain positions, and you can press buttons etc. and really see what that toy does and sounds like before you actually commit to spending money on it, right? So there I was, standing in front of talking crocodiles, singing dogs, plastic sheep, flashing trains and – nice one – colorful, exciting looking cars. Cars with sound and light. And as we all know: Men and little Kids are ALWAYS attracted to sound and flashing lights, right? Several Base Packs, like a Garage, an Airport, a Ramp-Set etc. The great thing is that with every new set that you buy, your existing cars will gain additional value. 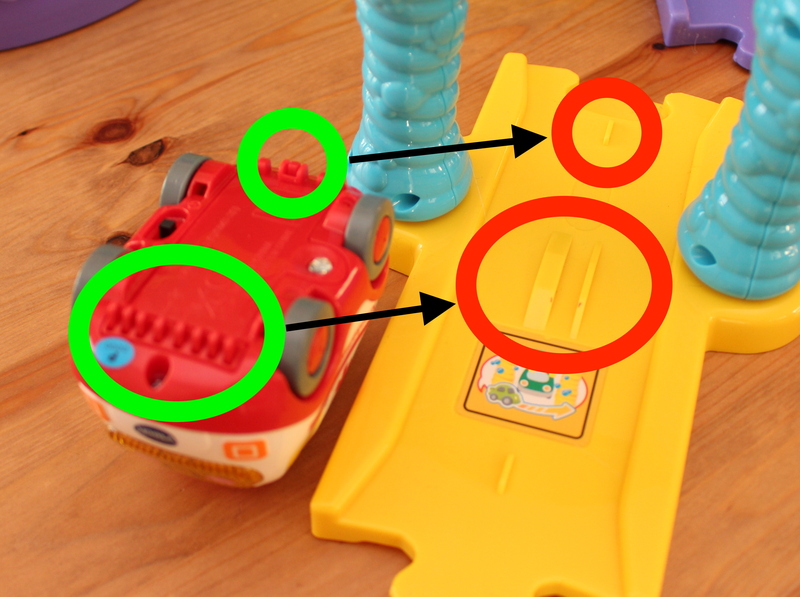 Each Go Go Car has several sentences and songs programmed and there are two ways you can trigger them: Manually by pressing the windshield-button or automatically by placing the cars on afore mentioned Smart Points (explained below). Every Smart Point triggers different sentences and/or songs. 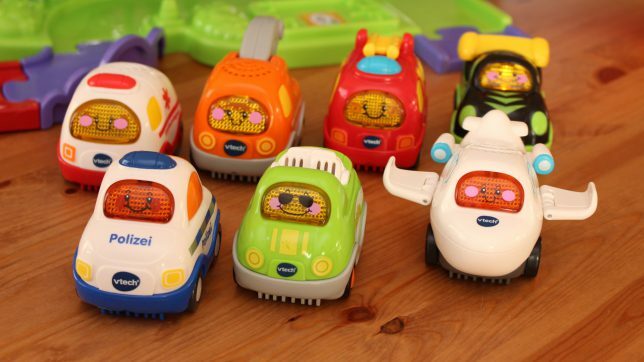 Long story short; what I am trying to explain is this: Whenever you decide to get another play set from VTech, the additional Smart Points that come with it will trigger new phrases and songs in your old, already existing cars. That way, there is always new stuff to explore: When you get a new set, you’re kid will find that even his “old” cars add new stuff to their playing experience. 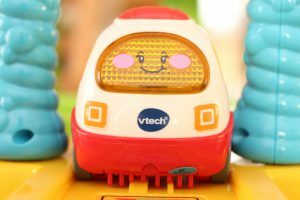 That is really smart move from VTech, and something I really love about this entire systems: Old toys do not get boring. When you buy a new set, there is always a reason to use play with all cars you already own, even the oldest have something new to add to your kid’s playing experience. So I mentioned those mysterious Smart Points before, and now I want to explain and show to you what these are and how they work. Essentially, each VTech Go Go Wheels Car has nine microswitches on its bottom; one in the back of the car, eight in the front. They work as triggers, and the Smart Points are able to push those triggers when you move the car over them or place them on top. Basically, Smart Points are tiny elevations in the Tracks of the Go Go Smart Wheel Sets. To give you an example: For this year’s Christmas Benjamin’s grandparents got him the “VTech Go! Go! 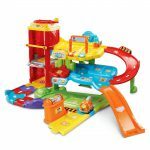 Smart Wheels Park and Learn Deluxe Garage“. It’s a great set with lot’s of different stuff, one of them being a fuel pump on the very top level. When you place a car in front of the fuel pump, the car will say something related to that content, for example: “I am refueling” or so. The fun thing is that EVERY car will say a DIFFERENT phrase! From a technical point of view, this is an 8-bit-code, which would allow for 256 different phrases Smart Point could trigger. I am, however, pretty sure that this system only uses a subset of this theoretical range. Smart Points aren’t really rocket science, but it adds lots of value to the entire system and makes it stand out compared to other car-play-kits and -sets. But let’s be honest: Talking cars can FREAK. YOU. OUT. At the time I am writing this article we have seven Go Go Smart Wheel Cars and when your kid starts playing with all of them at the same time, it can get really annoying. The parking garage itself also has a sound module, so if you don’t know about the counter measures you can take, you may find yourself throwing the entire set out of the window. To be honest, it is so simple, I thought it’s not even worth mentioning, but when I noticed that one of my neighbours was totally bugged by his kid playing with those talking cars all day and didn’t know what to do, I told him, and she was super surprised. I love playing those Go Go cars and toy sets together with my son whenever we can. It’s fun to let these cars race around the floor, and hear them talk all those phrases and sing funny songs. Benjamin loves them as well, it is definitely one of his favorite toys. The cars itself and the playing sets that we own are very robust as well, and well crafted. So I can say nothing negative in regards to that, either. I am very happy with my buying decision. I also want to mention that each car comes with a “demonstration battery” preinstalled. I was expecting this demo battery to run flat very soon, but even after six months we did not have to change the batteries. Pretty solid quality, given a price of less than $10 per car. 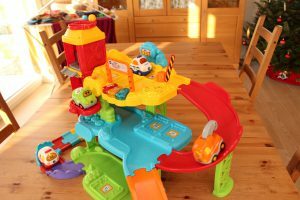 Therefore That Toy Dad, me Chris, rates VTech Go Go Smart Wheels 8/10: Compared to more creative construction toys like Lego, which is my personal 10/10, VTech Go Go Smart Wheels cannot keep quite up, as there simply is not much construction in these toy sets. You can, however, combine track parts in different ways and therefore be creative as well. It’s a great toy for you and your kids to enjoy. Go and get it!!! From Benjamin’s point of view (one and a half years old) he would probably rate VTech Go Go Smart Wheels 9/10! Great toy!!! 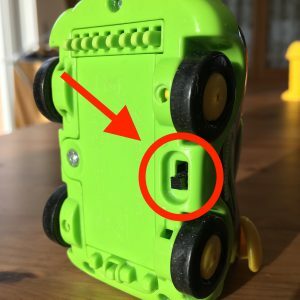 Any Issues Regarding Toy Safety? Nope, not at all. The toys are big enough so that you’re kids won’t be able to swallow small parts. All battery compartments are sealed by screws, so it needs an adult to open them and change the batteries. And even though Benjamin started to play with these toys early and heavily, there are no broken parts. These kits seem to be very solid. Did I miss your country? If you know what VTech Go Go Smart Wheels are named in your country, please get in touch with me, so I can add this information to the list above. Do you have something to add to this story? I am always eager to learn. 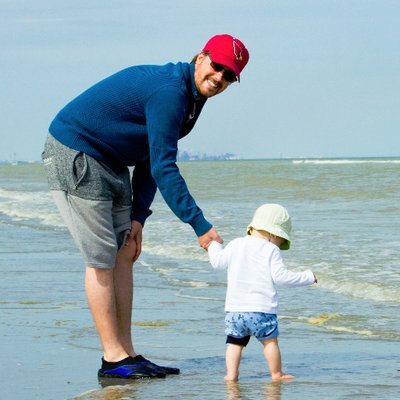 What is your favourite set, age recommendation, play style when playing with your kid etc. Please drop a comment below or holla at me at chris@ThatToyDad.com – I’m looking forward to your feedback! Individual cars are a bit expensive (about USD 10 each). Tip: Try to buy them bundled! How do I get hold of this toy if I am in Asia? I am in Manila to be specific. We have Toys R Us here but it is not as extensive as other branches in other countries. Is there an online link that you can point me to where I can buy it and have it shipped in no time? It’s my daughter’s birthday in March and she’s into cars (and buses, and trucks, LOL). I believe this is something my daughter and my hubby will love! Vtech Go Go Smart Wheels really do look like great toys I could buy for my little one who is also just a year old! I really like buying educational toys that help a child learn in a way that is not boring. This definitely looks like a fun toy for a one-year-old and I’ll check it out. Thank you so much for you comment Syed. Glad to hear I could help. Wish allhe best to you and your family. The vetch go go smart wheels seems like a GREAT choice for toddler boys. Heck, I have a nephew that is that age, and I know he would love these. Now I have a great birthday gift idea for him. I will bookmark this page, so that I can come back to it when I am ready to purchase. Hi Matt’s Mom, hi Matt 🙂 I’m so glad to hear that I could help you with my article! I’m sure your nephew will love the cars (and his dad will, too 🙂 ). You guys will have a great birthday party!!! Oh what a wonderful post. I’m a dad with 3 kids. Now I want a Vtech Go Go Smartwheel … not so much for them but for myself. Once I have mine, then maybe I’ll consider for them. Hahaha! Hey Chris! Absolutely brilliant first post! Really full of details. I like your site, everybody interested in candidly tested toys should follow you and visit your site.